Andrea and I were coming from south Charlotte yesterday after participating in a hike at McDowell Nature Preserve. Since we were passing through Steele Creek, I decided to stop at the Mac's Speed Shop location over there for lunch. 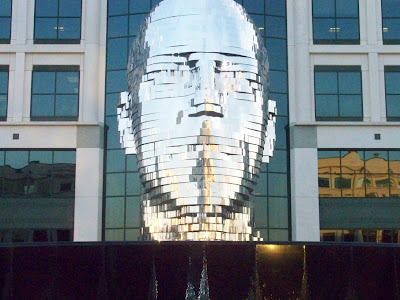 After leaving Mac's (I had the Hand Pulled Pork BBQ Platter with mac 'n cheese and onion rings and the complimentary hush puppies), I decided to take her to nearby Whitehall Corporate Center off Arrowood Road to see "The Big Head." She, like many people living in and visiting Charlotte, didn't know anything about Metalmorphosis. Constructed in 2007 by Czech Republic artist David Cerny for the opening of Whitehall Corporate Center, Metalmorphosis is a 25-foot tall, 14-ton stainless steel, motorized public art piece in the shape of a human head. 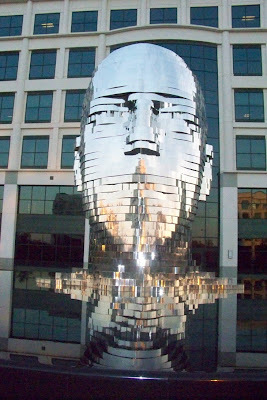 Comprised of seven layers, it rotates every few minutes and periodically spews water from its mouth into a fountain at its base. It attracts people daily who come to take pictures in front of it, like we did, but still many Charlotteans don’t know it’s there. Below is a quick video I captured of the head, showing it rotating near the end. You can also view it through a live web cam at www.metalmorphosis.tv.